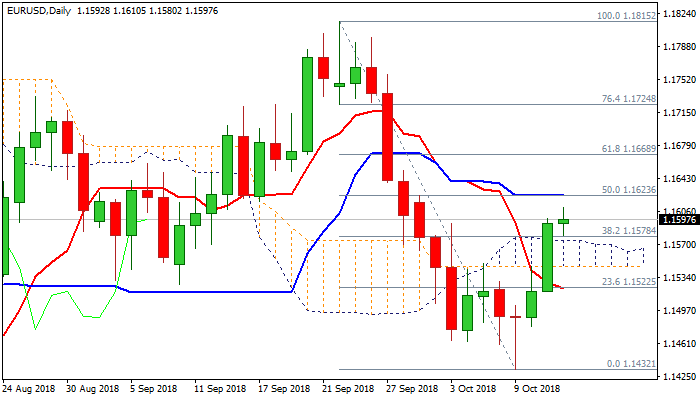 The Euro holds positive tone in early Friday’s trading and consolidating above daily cloud, following Thursday’s strong rally which resulted in break and close above cloud. The single currency was up 0.65% on Thursday (the biggest one-day gains since 20Sep), supported by weaker dollar as fresh sell-off was triggered by weaker than expected US CPI data. Positive tone from the minutes of the ECB’s last policy meeting, which suggests the central bank was on track to start normalizing its ultra-loose policy, added to Euro’s positive sentiment. Bullish signals on Thursday’s close above daily cloud top / Fibo 38.2% of 1.1815/1.1432 descend signal that recovery rally from 1.1432 (09 Oct spike low could extend. Fresh bulls eye a cluster of barriers at 1.1618 (converged 20/30SMA’s); 1.1623 (50% of 1.1815/1.1432) and 1.1628 (100SMA), with break here to generate fresh bullish signal. The pair is on track for bullish weekly close (after two weeks in red) as fresh acceleration higher penetrated thick weekly cloud (cloud base lays at 1.1578), which provides further positive signals. Rising momentum on daily chart supports, however, MA’s are still in mixed mode and slow stochastic is overbought, suggesting that bulls may take a breather before continuing. Top of broken daily cloud marks strong support (1.1574) and weekly close above here would add to bullish stance.